If you’re deciding between venue styles for your wedding day, we’ve got a solution to your problem. Magic Moments is a vendor that offers venues and venue styling to their clients in the Atlanta and Athens areas! Whether you want the elegance of a glass atrium, the rustic nature of an outdoor wedding, or the southern charm of a grand antebellum home, Magic Moments checks every box! With six different venues to choose from, you’re sure to find one that’s perfect for you! Among the rolling hills on the outskirts of Athens, Georgia is Cloverleaf Farms, a venue that defines the meaning of southern charm. 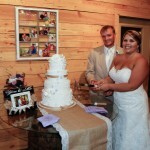 The centerpiece of this venue is a large farmhouse that provides multiple options for the ceremony or the reception. The upstairs area of the home serves as the bridal suite and has a beautiful view of the farm to keep the bride feeling calm, cool, and collected before the ceremony. Upon exploring this farm you can find a horse barn, a pecan grove, a vineyard, and a brick-enclosed courtyard garden. Among the rolling pastures you’re sure to find touches of cloverleaf to bring you some luck on your big day! Check out Cloverleaf Farm’s Instagram! 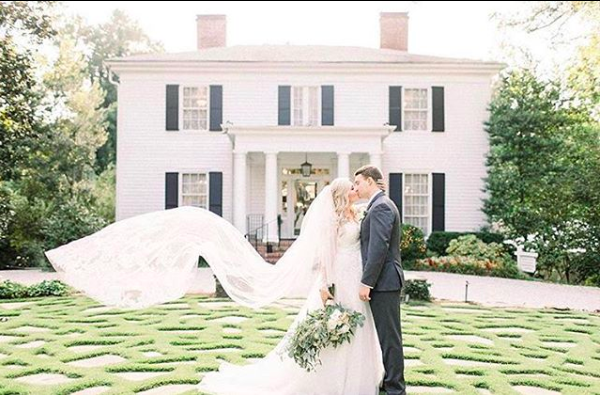 If you’re interested in going back in time on your wedding day, Flint Hill provides a beautiful antebellum home that will bring elegance and southern charm to your ceremony. The home encompasses an open floor plan where you can find a grand ballroom, a large wooden bar, a bridal suite, and a groom’s room. Outside the home, you’ll be sure to fall in love with the courtyard, covered pavilion, and a gazebo draped in fragrant jasmine. 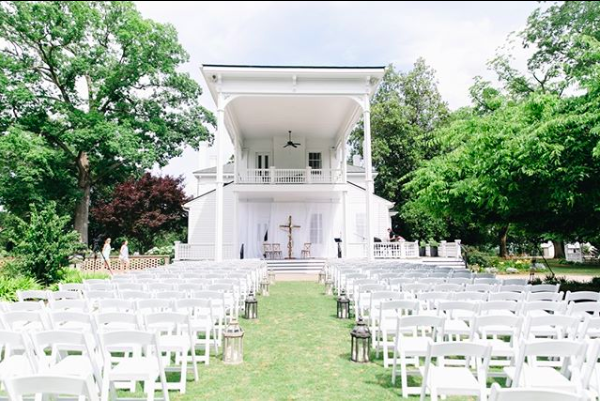 This venue is located in Norcross, Georgia and is perfect for a bride who wants many options for ceremony space and picturesque opportunities. 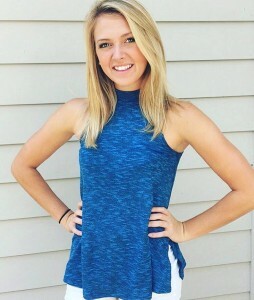 Check out Flint Hill’s Instagram! 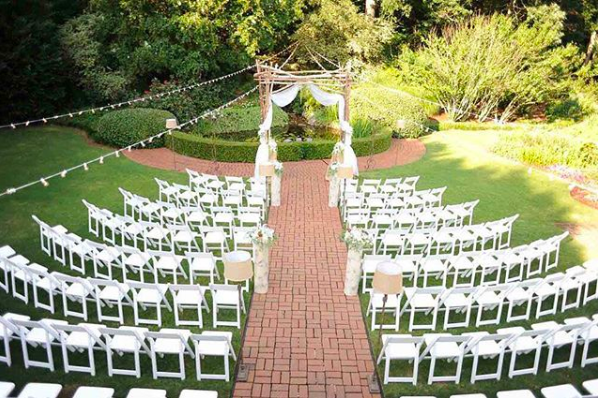 Another luxurious venue that offers an intimate environment is Primrose Cottage in Roswell, Georgia. The most desirable attribute of this venue is the glass-encased grand ballroom. These floor-to-ceiling windows give perfect views to the nature surrounding this venue. There are bridal and groom suites in the home and porches that look over the garden outside the ballroom. When you step into this venue you’ll surely be blown away by how much elegance is brought into the style of every room. Check out Primrose Cottage’s Instagram! If you’re searching for the perfect spring or summer venue, look no further! Located in Norcross, Georgia, the Atrium is a two story ballroom encased in floor-to-ceiling glass windows. Surrounding this venue is a garden filled with flowers that will add beautiful scenery and a sweet aroma to your big day! Azaleas, hydrangeas, daylilies, and gardenias are just some of the flowers planted around the gardens that make your wedding so colorful and classy. There’s two courtyards on the venue’s property, one of which has a stone gazebo with an iron dome for an intimate outdoor wedding. Check out The Atrium’s Instagram! Sitting among a 3 acre estate is a colonial style home with an enchanted outdoor area called Little Gardens. 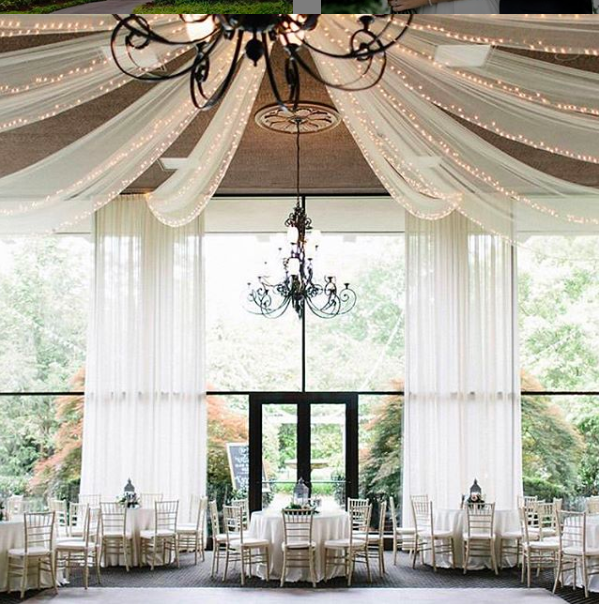 This venue is located in Atlanta, Georgia and will definitely bring southern charm to your big day. 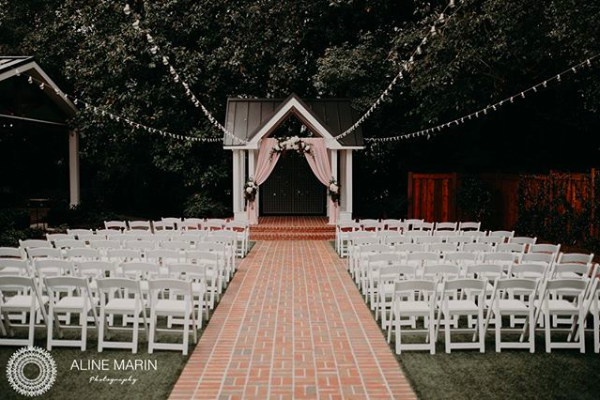 The ballroom and the secluded garden are separated by a line of beautiful french doors that open up allowing for an indoor-outdoor ceremony if you’re unable to choose between the two. Among all the blooming flowers in the garden is a waterfall and Japanese koi pond. The sound of this cascading waterfall will be sure to calm your nerves during the ceremony. On top of these outdoor elements, there is also a luxurious bridal suite to get ready and relax in before the ceremony. Check out Little Gardens’ Instagram! The most popular outdoor wedding venue offered by Magic Moments is Vinewood Stables located in Newnan, Georgia. Among the hills and rolling pastures you can find a plantation house and a historic horse barn scattered with giant oak trees. 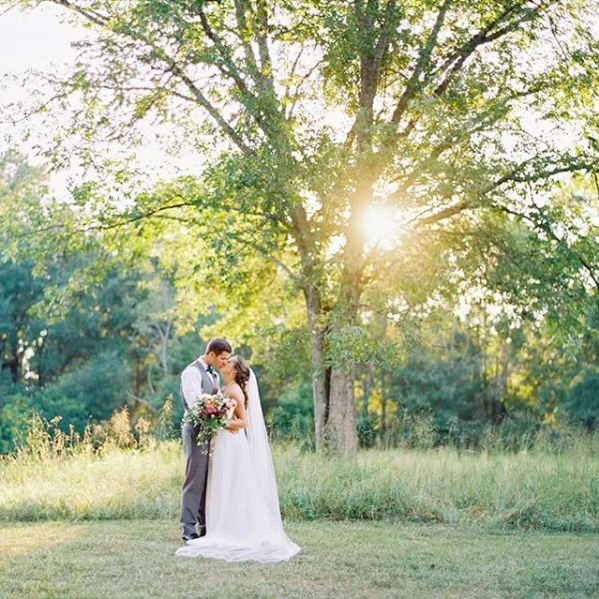 On the property you can find an ancient pecan tree that’s a perfect backdrop for your ceremony. If you’d like to have more rustic charm, you could have the ceremony at the stables. 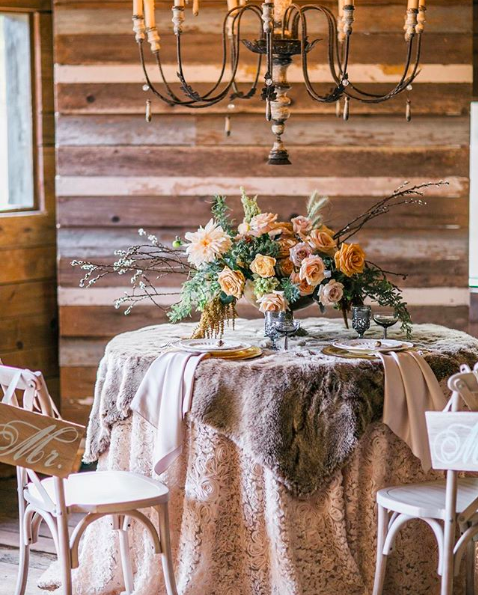 It may sound a little odd at first, but these old stalls have been transformed to bring you the utmost elegance for your southern wedding experience. The main house is also available for your wedding day to be used as a bridal suite or other pre wedding activities. Check out Vinewood Stables’ Instagram! With so many great option for your wedding day, Magic Moments is sure to provide one that catches your attention. To read more about Magic Moments and the venues they offer check out their website by clicking here!